Since 2001, BayesiaLab has been the undisputed reference standard for Bayesian network software. Version 8 raises the bar even higher by further expanding the range of research and analytics applications of the Bayesian Network formalism. With BayesiaLab 8, the powerful properties of the Bayesian Network paradigm can be utilized even better for exploring complex, high-dimensional problem domains. The Start-Up Page gives you quick access to BayesiaLab's main functions and recent networks. You can choose the Appearance of each node from five predefined graphical elements: Disc, Badge, Monitor, Gauge, and Bar. When copying nodes, arcs, and notes, you can also Paste the Format of these objects. The Data Import Wizard suggests the number of bins for the discretization of your continuous variables according to the number of observations in your data set. R2-GenOpt*, an extended version of R2-GenOpt, utilizes a specific MDL score for choosing a suitable number of bins. Parameter Updating takes into account the observations set in the monitors for updating the quantitative part of the Bayesian network. In addition to the Multi-Quadrant Analysis, you can analyze segmented datasets with the Impact on Target and Profile tools. You can use Search to find and run Actions. You can directly associate Long Names with nodes without having to use the Node Comment field. The brand-new WebSimulator Editor allows you to define and test all settings of your simulator within BayesiaLab before publishing it. Users of BayesiaLab Floating Token Licenses can define an Inactivity Timeout for Automatic Disconnect with the Bayesia License Server. Additionally, a completely new set of icons gives BayesiaLab 8 a fresh and sharp look across all devices, screen sizes, and resolutions. 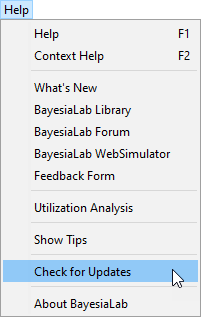 For a complete documentation of all new features, please see the BayesiaLab Library. Bayesia's CEO and co-founder, Dr. Lionel Jouffe, explained some of the innovations of BayesiaLab 8 at his presentation at the 6th Annual BayesiaLab Conference in Chicago, November 1–2, 2018. Existing users will be prompted to download the new version when they start up their current version of BayesiaLab (5.4 or higher). Alternatively, you can check for available updates via the Help menu in BayesiaLab. The upgrade is free for all rented/term licenses and for perpetual licenses with a current Technical Support subscription. If your subscription has expired, please contact us via email at support@bayesialab.com so we can let you know about renewal options. Please note that xbl files saved with BayesiaLab 8 cannot be opened with earlier versions of BayesiaLab. For those new to BayesiaLab, you can apply for a 30-day evaluation version by registering here: BayesiaLab 8 Evaluation. If you've already tried BayesiaLab in the past, we invite you to start a fresh evaluation. Please check our our online stores for Europe/Rest of World and North America. Alternatively, you can contact us via email at support@bayesialab.com to have us prepare a formal quote.